Koupahi, H., Honarmand Jahromy, S., Rahbar, M. (2016). Evaluation of Different Phenotypic and Genotypic Methods for Detection of Methicillin Resistant Staphylococcus aureus (MRSA). Iranian Journal of Pathology, 11(4), 370-376. Hossein Koupahi; Sahar Honarmand Jahromy; Mohammad Rahbar. "Evaluation of Different Phenotypic and Genotypic Methods for Detection of Methicillin Resistant Staphylococcus aureus (MRSA)". 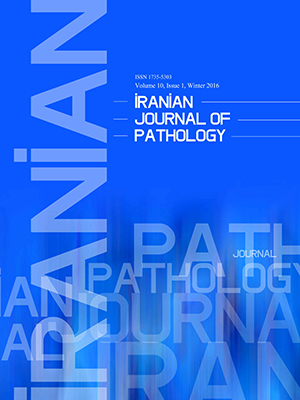 Iranian Journal of Pathology, 11, 4, 2016, 370-376. Koupahi, H., Honarmand Jahromy, S., Rahbar, M. (2016). 'Evaluation of Different Phenotypic and Genotypic Methods for Detection of Methicillin Resistant Staphylococcus aureus (MRSA)', Iranian Journal of Pathology, 11(4), pp. 370-376. Koupahi, H., Honarmand Jahromy, S., Rahbar, M. Evaluation of Different Phenotypic and Genotypic Methods for Detection of Methicillin Resistant Staphylococcus aureus (MRSA). Iranian Journal of Pathology, 2016; 11(4): 370-376. Background: Methicillin resistant Staphylococcus aureus (MRSA) has been emerged as a nosocomial and community acquired pathogen worldwide. There are many challenges for laboratory detection of MRSA. The aim of this study was to compare different phenotypic methods with PCR based method as a gold standard for detection of mecA gene. Methods: A total of 220 clinical isolates of S. aureus which were isolated from various clinical specimens from September 2013 until the June of 2014 in Milad Hospital of Tehran, Iran was subject of our study. Methicillin resistance was determined by oxacillin and cefoxitin disks, oxacillin screen agar and CHROMagar™ MRSA medium. The results of these methods were compared with mecA gene based PCR method as a gold standard method. Results: Among 220 isolates from S. aureus, 105 (47.72%) isolates were positive for mecA gene by PCR method. The results of cefoxitin disk diffusion method with 100% sensitivity and specificity was the same as PCR method .CHROMagar™ MRSA medium had 98.13% sensitivity and 100% specificity. Oxacillin disk diffusion and oxacillin screen agar had 95.42% and 97.22% sensitivity respectively. Conclusion: Result of cefoxitin disk diffusion method with 100% sensitivity and specificity was the same as PCR method for detection mecA gene. Cefoxitin disk diffusion method can be used as an alternative method of PCR for detection of MRSA. Lozano C, Gómez-Sanz E, Benito D, Aspiroz C, Zarazaga M, Torres C. Staphylococcus aureus nasal carriage, virulence traits, antibiotic resistance mechanisms, and genetic lineages in healthy humans in Spain, with detection of CC398 and CC97 strains. Int J Med Microbiol 2011; 301(6): 500-5. Michiels B, Appelen L, Franck B, den Heijer CD, Bartholomeeusen S, Coenen S. Staphylococcus aureus, Including Meticillin-Resistant Staphylococcus aureus, among General Practitioners and Their Patients: A Cross-Sectional Study. PLoS One 2015 ;12;10(10):e0140045. Khanal R, Sah P, Lamichhane P, Lamsal A, Upadhaya S, Pahwa VK. Nasalcarriage of methicillin resistant Staphylococcus aureus among health care workers at a tertiary care hospital in Western Nepal. Antimicrob Resist Infect Control 2015 Oct 9; 4:39. Brown J, Li CS, Giordani M, Shahlaie K, Klineberg EO, Tripet-Diel JR, Ihara MS, Cohen SH. Swabbing Surgical Sites Does Not Improve the Detection of Staphylococcus aureus Carriage in High-Risk Surgical Patients.Surg Infect (Larchmt) 2015; 16(5):523-5. Enright MC, Robinson DA, Randle G, Feil EJ, Grundmann H, Spratt BG. The evolutionary history of methicillin-resistant Staphylococcus aureus (MRSA). Proc Natl Acad Sci U S A 2002 May 28;99(11):7687-92. Anand KB, Agrawal P, Kumar S, Kapila K. Comparison of cefoxitin disc diffusion test, oxacillin screen agar, and PCR for mecA gene for detection of MRSA. Indian J Med Microbiol 2009 Jan-Mar; 27(1):27-9. Strommenger B, Bartels MD, Kurt K, Layer F, Rohde SM, Boye K, Westh H, Witte W, De Lencastre H, NübelU.Evolution of methicillin-resistant Staphylococcus aureustowards increasing resistance. J Antimicrob Chemother 2014; 69(3):616-22. Bhutia KO, Singh TS, Biswas S, AdhikariL.Evaluation of phenotypic with genotypic methods for species identification and detection of methicillin resistant in Staphylococcus aureus. Int J Appl Basic Med Res2012; 2(2):84-91. You JH, Ip DN, Wong CT, Ling T, Lee N, IpM. Meticillin-resistant Staphylococcus aureus bacteraemia in Hong Kong. JHosp Infect 200:70(4):379-81. Boşgelmez-Tinaz G, Ulusoy S, Aridoğan B, Coşkun-Ari F. Evaluation of different methods to detect oxacillin resistance in Staphylococcus aureus and their clinical laboratory utility .Eur J ClinMicrobiol Infect Dis 2006 ;25(6):410-2. Askari E, Soleymani F, Arianpoor A, Tabatabai SM, Amini A, Naderinasab M. analysis. Iran J Basic Med Sci 2012; 15(5):1010-9. Rodvold KA, McConeghyKW.Methicillin-resistant Staphylococcus aureus therapy: past, present, and future. Clin Infect Dis 2014 Jan; 58Suppl 1:S20-7. doi: 10.1093/cid/cit614. Review. Velasco D, del Mar Tomas M, Cartelle M, Beceiro A, Perez A, Molina F, Moure R, Villanueva R, Bou G. Evaluation of different methods for detecting methicillin (oxacillin) resistance in Staphylococcus aureus. JAntimicrob Chemother. 2005; 55(3):379-82. Brown DF1, Edwards DI, Hawkey PM, Morrison D, Ridgway GL, Towner KJ, Wren MW; Joint Working Party of the British Society for Antimicrobial Chemotherapy; Hospital Infection Society; Association. Guidelines for the laboratory diagnosis and susceptibility testing of methicillin-resistant Staphylococcus aureus (MRSA). J AntimicrobChemother 2005 ;56(6):1000-18. Isenberg HD, editor. Clinical microbiology procedures hand book. 2nd ed. Washington DC: ASM Press; 2004. Unal S, Hoskins J, Flokowitsch JE, Wu CY, Preston DA, Skatrud PL. Detection of Methicillin-resistant staphylococci by using the polymerase chain reaction. J Clin Microbiol 1992; 30:1685-91. Perez-Roth E, Claverie-Martin F, Villar J, Mendez-Alvarez S. Multiplex PCR for the simultaneous identification of Staphylococcus aureus and the detection of methicillin and mupirocin resistance. J Clin Microbiol 2001; 39:4037-41. Clinical and Laboratory Standards Institute CLSI 2014. Performance standards for antimicrobial susceptibility testing; 24th informational supplement. Velasco V, Sherwood JS, Rojas-García PP, Logue CM ..Multiplex real-time PCR for detection of Staphylococcus aureus,mecA and Panton-Valentine Leukocidin (PVL) genes from selective enrichments from animals and retail meat. PLoS One 2014; 21;9(5):e97617. Velasco D1, del Mar Tomas M, Cartelle M, Beceiro A, Perez A, Molina F, Moure R, Villanueva R, BouG.Evaluation of different methods for detecting methicillin (oxacillin) resistance in Staphylococcus aureus. J Antimicrob Chemother 2005 ; 55(3):379-82. Pramodhini S., Thenmozhivalli P.R., Selvi R., Dillirani V., Vasumathi A., Agatha D.Comparison of Various Phenotypic Methods and mecA Based PCR for the Detection of MRSA .J Clin Diag Res 2011 ;5:1359-1362. .
Kunsang O Bhutia, T Shantikumar Singh, Shilpie Biswas, Luna Adhikari. Evaluation of phenotypic with genotypic methods for species identification and detection of methicillin resistant in Staphylococcus aureus .Int J Appl Basic Med Res 2012; 2(2): 84–91. Anand KB , Agrawal P, Kumar S, Kapila K. Comparison of cefoxitin disc diffusion test, oxacillin screen agar, and PCR for mecA gene for detection of MRSA. Indian J Med Microbiol 2009; 27(1):27-9. Abbas Farahani, Parviz Mohajeri, Babak Gholamine, Mansour Rezaei, and Hassan Abbasi2 Comparison of Different Phenotypic and Genotypic Methods for the Detection of Methicillin-Resistant Staphylococcus Aureus. N Am J Med Sci 2013; 5(11): 637–640. Rahbar M. Safadel NA. Evaluation of Cefoxitin Disk Diffusion Test for Routine Detection of Methicillin-resistant Staphylococcus Aureus. Iranian J Pathol 206; 1:145-148. Louie L, Soares D, Meaney H, Vearncombe M, Simor AE. Evaluation of a new chromogenic medium, MRSA select, for detection of methicillin-resistant Staphylococcus aureus. J Clin Microbiol 2006; 44:4561–3. Perry JD, Davies A, Butterworth LA, Hopley AL, Nicholson A, Gould FK. Development and evaluation of a chromogenicagar medium for methicillin-resistant Staphylococcus aureus. J Clin Microbiol 2004 ; 42(10):4519-23. Han Z, Lautenbach E, Fishman N, NachamkinI. Evaluation of mannitol salt agar, CHROMagar Staph aureus and CHROMagar MRSA for detection of meticillin-resistant Staphylococcus aureus from nasal swab specimen. J Med Microbiol 2007 ; 56(Pt 1):43-6. Ghasemian A, NajarPeerayeh S, Bakhshi B, Mirzaee M. The Microbial Surface Components Recognizing Adhesive Matrix Molecules (MSCRAMMs) Genes among Clinical Isolates of Staphylococcus aureus from Hospitalized Children. Iran J Pathol 2015 Fall;10(4):258-64.